We live in a noisy world. Interference from light, vibrations, electromagnetic radiation and sound can be annoying; it messes with our sleep and can interfere with our electrical equipment. For physicists who study the very small and the very far away, noise can be a deal-breaker. To reduce it, they often need to come up with large, expensive solutions. 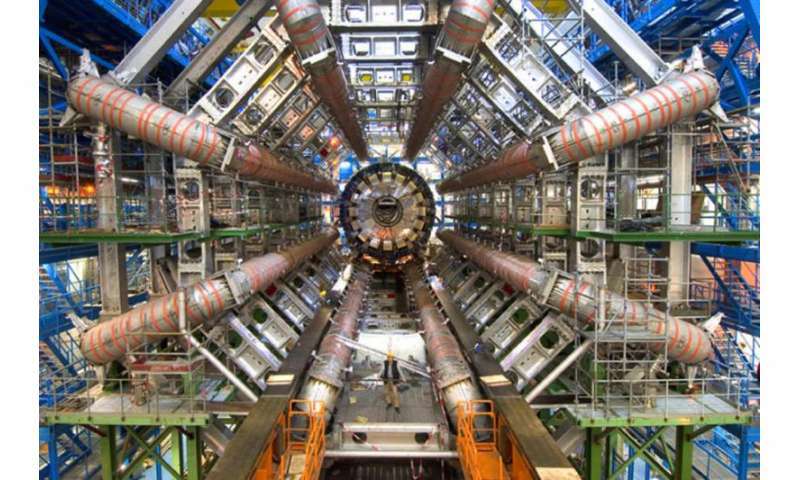 They had to build the world's largest and most powerful particle accelerator to see the tiny signal from the Higgs Boson particle, and the world's longest and most sensitive ruler to see gravitational waves. Scientists have to send telescopes into space to avoid the noise of our atmosphere if they are to see the details of the most distant galaxies. But the solution isn't always on such a grand scale. In new research published in Nature Physics, a group of physicists from the University of Melbourne have found a way to reduce the noise experienced by quantum sensors just by spinning them. 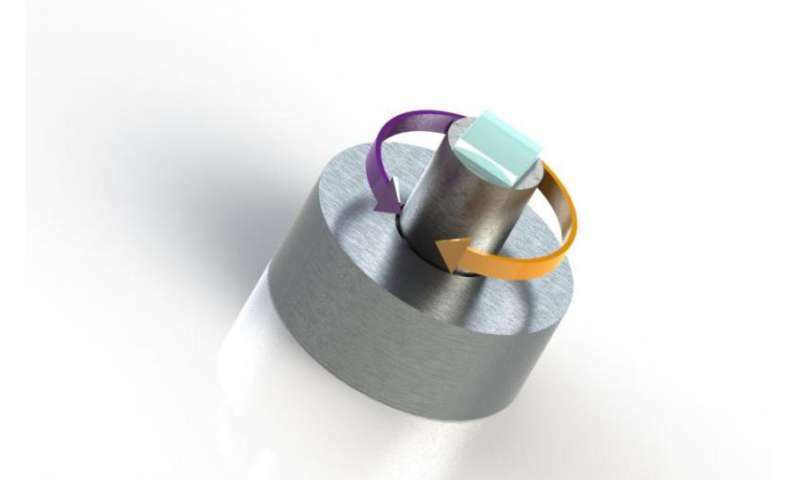 Quantum sensors are highly sensitive and among their many promising applications they are ushering in a new era of MRI (Magnetic Resonance Imaging) that is making visible the tiny details inside cells and proteins. A particularly promising quantum sensor is the nitrogen vacancy (NV) centre, found in diamonds. This is an atomic-level flaw, where a nitrogen atom replaces a carbon atom, trapping electrons in a quantum state. "An electron is essentially a bar magnet," says Dr Alexander Wood from the School of Physics at the University of Melbourne, who was first author on the Nature Physics paper. "It has a north pole and a south pole. And if we put an electron in a magnetic field, it will spin very rapidly." But the electrons in NV centres aren't the only magnets in a diamond. "In a diamond you have two kinds of carbon. Most are what is called carbon-12, which is pretty boring," says Dr Wood. "However, about 1 in every 100 carbon atoms is a carbon-13. It has an extra neutron. "Like electrons, the nucleus of each of these carbon-13 atoms is like a little bar magnet. And, like a bar magnet, if you put a carbon-13 nucleus in a magnetic field, it spins." Quantum states rely on a property called coherence, which is sensitive to environmental 'noise' that can lead to a loss of the quantum state, known as dephasing. Associate Professor Andy Martin, who led the Australian Research Council funded study, says that maintaining the quantum state of NV centres is hard. "A quantum state is fragile. It's fragile to the magnetic field in particular. If you have fluctuations in the magnetic field it will dephase the quantum sensor." Professor Hollenberg, who leads a University of Melbourne research group on quantum sensors, likens the quantum state to a bubble. "If your environment is prickly, then the quantum state won't last very long. But if your environment is less prickly, that bubble will last a lot longer," he says. "This is the principle by which we can sense the environment around the NV centre at extremely small scales and high sensitivity." In the study, researchers sought to reduce the effect of dephasing by quickly rotating the whole system. "The spinning atomic bar magnetics of the carbon-13 atoms create prickles in the magnetic field – they interact with the NV centres, affecting its coherence and ability to sense," says Associate Professor Martin. Minimising the noise from carbon-13 increases the sensitivity of quantum sensors, which should lead to greater insights into the nanoscale world. This can be achieved using synthetically engineered and expensive isotopically pure carbon-12 diamonds, or by stopping the carbon-13 atoms from spinning. 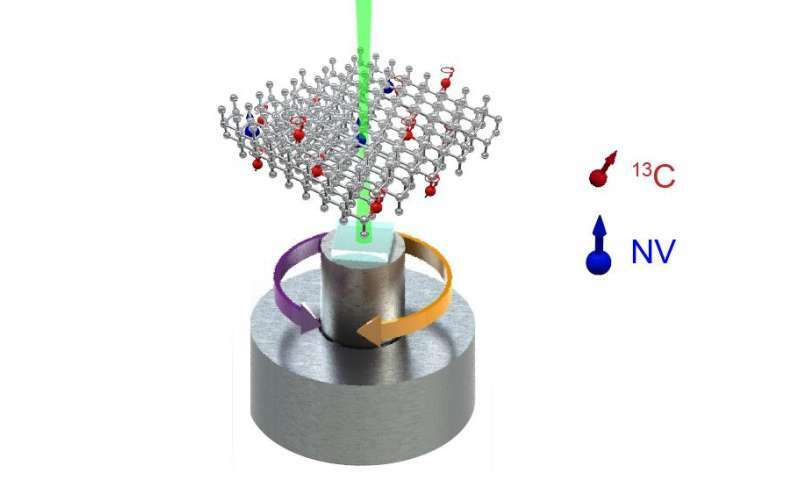 The problem with stopping the carbon-13 spinning is that the NV centre electrons would also stop spinning, and this spinning is crucial to how these quantum sensors work. The solution is to trick the NV centre into thinking the atomic bar magnets of the carbon-13 atoms have stopped spinning. To do this the team, working in the laboratory of Professor Robert Scholten, used a technique from classical physics. It involves rotating the whole diamond at high speeds. "In the magnetic field that we typically use, atomic bar-magnets of the NV centres will spin about 2.8 billion times per second, whereas the carbon-13 will spin about 5,000 times per second," says Dr Wood. "Because it is already spinning so fast, if we rotate the entire diamond at 5,000 times per second, the atomic bar-magnet of the NV centre isn't affected. "But the carbon-13 atoms are affected. And because the NV centre and the carbon-13 are now in the same frame of reference, rotating at 5,000 times a second in the same direction as the carbon atoms spin, it means the NV centre sees the carbon-13 as essentially stationary. "So you can effectively cancel the magnetic fields from the carbon-13 that these sensors see by putting your sensor and the carbon-13 inside the same rotating frame." "What we have here is an environment that when you are not rotating is quite spiky. And when you rotate it, it becomes less spiky, increasing the longevity of the quantum state," says Associate Professor Martin. Based on this we would assume that the optimum precision would occur when the diamond was spinning at exactly the same rate as the carbon-13. But the researchers found that this wasn't the case. "You would expect the quantum-ness of the sensor to go up and up until the carbon-13 spins are frozen in the rotating frame, but as we get closer to the frozen frame, the coherence starts to go down, because the carbon-13s start interacting with each other, adding noise back into the system," says Dr Wood. The researchers have determined the pseudo field that gives the greatest reduction in noise from the cabon-13 spins. "The sweet spot seems to be in a total magnetic field – which is the combination of the normal field and the rotating frame pseudo field – of one Gauss, which equates to the sensor seeing the carbon spin about 1000 times per second," says Dr Wood. "The Gauss is a measurement of magnetic flux density, or magnetic field strength. For example, a fridge magnet is about 100 Gauss and the Earth's magnetic field strength is about half a Gauss." While this technique could soon be used to improve the precision of quantum MRI scanners, Associate Professor Martin says it may also help to answer some fundamental questions in physics. "For example, quantum sensors could assist in answering such questions as; when does a fluid become a fluid?" he says. "Take a water molecule, that's not a fluid. Take two water molecules, that's not a fluid either. At some point it becomes a fluid and it's all to do with the scale at which you are probing. And you can only look at that if you can probe down to those scales. "Now you have these sensors based on nitrogen defects in diamonds. They don't have to be a big diamond like a diamond ring, they can be nano-crystals. They can be extremely small. "So you begin to have these devices that can measure translational and, now, rotational movement. It gives you a probe on these very small scales, not just in terms of magnetic fields but in terms of the translational and rotational motion."